Here are a few things you should consider for your Gilbert garage remodel! Most people’s garages look like the place that Christmas decorations, tools, and boxes of stuff went to die. If they can still fit a car in there, they can only barely squeeze by all the stuff piled high to get to the door. Most garages have a bare concrete floor that’s dusty and not very pretty to look at. But you can’t really put down tile or another decorative floor choice because you’ll be driving your car over it and dripping oil all over it. You can have a beautiful and functional floor by choosing Gilbert garage floor coatings. These Gilbert epoxy flooring and polyaspartic floor coatings not only protect the floor, but they also give it a beautiful shine and a smooth surface. The coatings can also come with a stain to color your floor and improve its look. Your garage floors can look as good as your kitchen floors but be much more durable. You need a good storage system for any garage, and the best place to start is with sturdy and beautiful Gilbert garage cabinets. If you are a woodworker or like to tinker with projects, you can set up a system of cabinets to create a workshop in your garage. If you just need to storage lawn equipment and other basic household supplies, just one or two large cabinets may be all you need. The best way to keep your garage organized is to create a zone for the different things you store. For example, you might have a zone for yard equipment, a zone for sports gear, a zone for wood working, and a zone for holiday decorations. You can set up actual partitions to make your zones more clear. For example, you can use chain-link fence or even doors mounted on rails. Be creative to get the look you want. Keep your garage organized by installing racks, shelves, and hooks to ensure that every tool, shovel, and piece of equipment has its own place. Don’t throw things in drawers or lean them against the wall. Set up a proper organization system, and your garage will look like a whole new place. 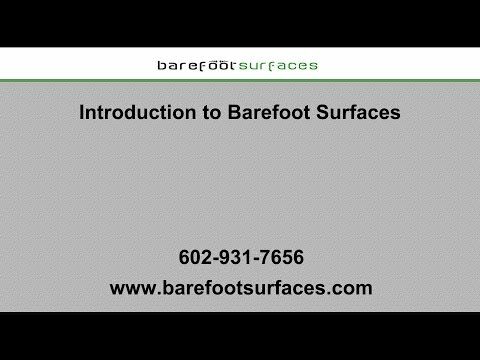 Barefoot Surfaces can help you with your Gilbert garage remodeling project. We offer garage floor coatings and beautiful garage cabinets. Our flooring options include decorative concrete overlays, metallic epoxies, stained concrete, sealed concrete, and more. We can transform the look of your garage floor while also improving its life span. Our garage cabinet systems will help you get organized and create a professional working space in your garage. Call us today to explore the options for your Gilbert garage and transform your dark, crowded space into a beautiful and functional working and storage space. And make sure to ask about outdoor epoxy floor coatings in Gilbert for the ultimate look and protection for your patio!